Today is Grandma B's birthday. (HAPPY BIRTHDAY!) The family celebrated the occasion this last Sunday. I couldn't be there because of a horrible head cold that just wouldn't go away. I was sad at missing the get together, but I had fun helping my kids make a gift for their grandmother. We love working with play dough in our house. My kids also really enjoy creating gifts for people. Personally, I love seeing them experience the joy of making something for someone else and then the joy of giving their creation away. 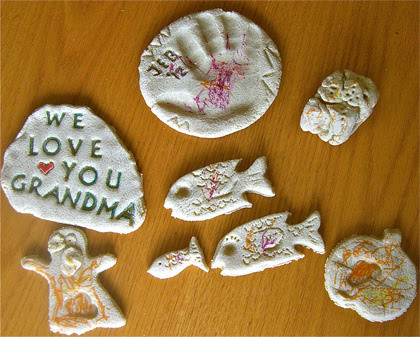 I put together a batch of salt dough and got out some cookie cutters and letter stamps. 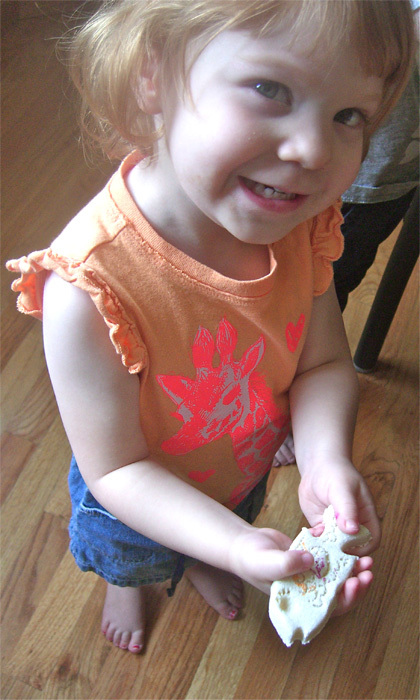 Both Jellybean and Buddy enjoyed playing with the dough. If left to her own devices, Jellybean just rips dough apart in tiny pieces (she also kept licking the dough), so I helped her cut out some fish. 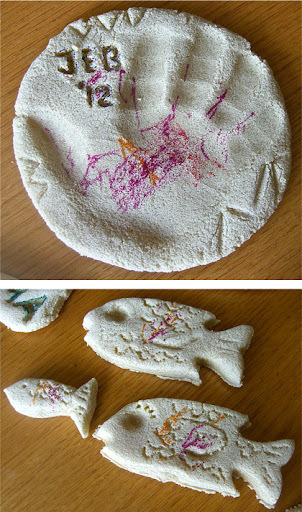 Under her instruction, there had to be a mama, a dada and a baby fish. I also rolled out a circle so she could do a hand impression. Buddy lives for Halloween and was very attracted to the pumpkin and ghost cookie cutters. He also molded together a "monster box." Apparently, Grandma knew immediately that it was from him due to the "ABC" stamped on the outside (his other obsession is with the alphabet). After the salt dough was baked and cooled, I got out some markers and let them color their creations. -When cool, paint or decorate. You may wish to varnish or cover with gloopy glue when dry. 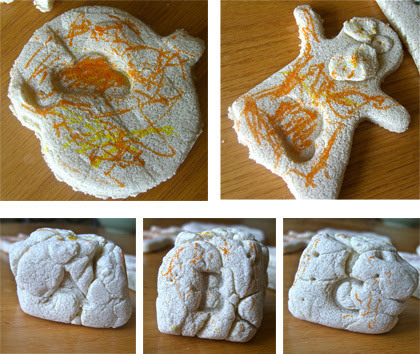 When researching salt dough recipes, I came across a great resource for play dough recipes: The Imagination Tree. 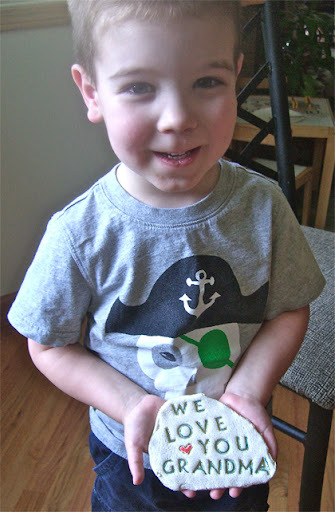 The post has over a dozen recipes/ideas for using play dough. It also talks about the benefits of working with play dough and how the medium of play dough encourages imaginative play. It's worth a read. You should definitely try salt dough. It's very easy to put together and I like how soft it is to work with. Great for little hands. Thanks for following! 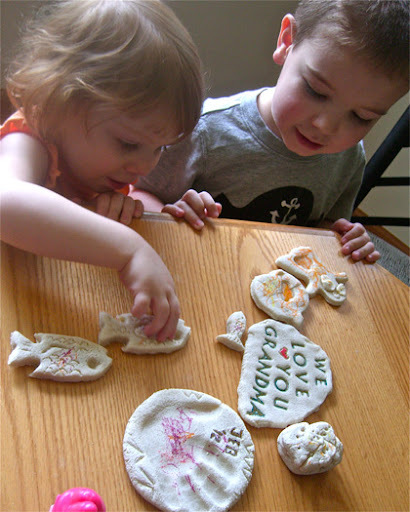 What a fun and budget-friendly gift for grandparents! Thanks for visiting my place. Great idea for personalized gifts! Thank you for sharing at Sharing Saturday! !